An ancient Act of 1585 legally permitted the laird to evict tenants or sub-tenants provided he gave them 40 days notice. If they failed to comply he could bring in troops to evict them. By the end of the 18th Century several of the old Mackenzie family estates had to be sold for financial reasons. Throughout the 19th Century in Lochbroom as in other parts of the Highlands & Islands much distress and hardship was caused by the new breed of lairds clearing whole communities from fertile land that their families had occupied for many years to make way for sheep farmers from the south who could afford to pay high rent for the land. James Hogg, the Ettrick Shepherd, recalled seeing crops left unharvested in the field of Strathnasealg, a lovely glen behind An Teallach, after it was cleared. (He toured these parts in the early 1800s). There was a population of 30 or 40 families in Strathnasealg and Glen Gruinard, before the Clearances. Hogg records how the Dundonnell laird, George Mackenzie of the 1st Mackenzie dynasty hesitated to clear people off his land although it would be to his financial advantage to do so. Ground Officers and factors showed no compassion to these poor destitute families (apart from the laird, minister and school master – if there was one – no-one had cash “in those days”). Theirs was a frugal existence, living on what they grew. If rent had to be paid it was paid “in kind”. For people living near the sea, fish was plentiful. No provision of food or shelter awaited evicted families when they found a safe place to settle. In 1820 about 55 families were evicted from Inverlael and Braemore. Inverbroom and Achindrean were also cleared pre – 1850. 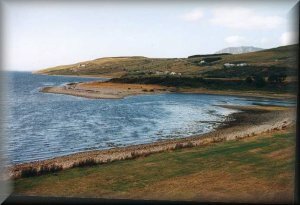 Other evictions took place here and there including some in Coigach – one attempt to evict there was unsuccessful because the officers with the warrant were attacked and humiliated by a band of irate women. By 1836, Dundonnell Estate was sold by the trustees to Murdo Munro Mackenzie of Ardross. This family had come over from Australia (after the death of the old Geo. Mackenzie of the 1st MacKenzie dynasty, a son, Kenneth, took over the estate. He died young and even before his death the estate was burdened with debts and in the hands of trustees). Under this Mackenzie of Ardross there were heartless clearances from Kildonan circa. 1840 and Keppoch, Dundonnell. Twenty families (128p) were sent to settle on strips of poor rocky soil described in the Napier Report as mostly black moor and heather. They had to bed down in the heather in an exposed site until they could construct some sort of shelters for their families (there were many children) and animals, against the elements. To bring the soil into a state suitable for growing corn, hay and potatoes, it was necessary for the families to make dangerous trips in open boats to the Summer Isles 10 miles away to cut boatloads of seaweed for fertiliser and shell sand to improve the peaty soil. They had a 50 yard stretch of beach to gather seaweed from, and as seaweed takes 3 years to grow they had no way of getting adequate supplies near home. The Leckmelm evictions were the last on the Scottish mainland. In 1880 an Aberdeen industrialist cleared about 100 people from their homes and fields. He had great plans for improving his estate and buildings etc. His actions got widespread publicity and adverse criticism. The Free Church minister championed the people’s cause and it was after this that a Commission was set up to enquire into crofting grievances. The Crofting Act 1886 gave crofters certain rights including security of tenure and compensation for the outgoing tenants for improvements e.g. buildings and reclamation of land. Some members of evicted families got assisted passages to Canada, Australia and New Zealand, where as a rule, they prospered although the going was very hard at first. Often they would have to clear land, felling giant trees, the wife in the cabin meantime anxiously listening to see if the axe would start again. There are well authenticated incidents connected with the harshness of the Clearances e.g. people seeing their houses on the shores of Gruinard Bay going up in flames as they walked home from church, or the Ground Officer coming to evict a teenage orphan girl and her brothers taking the potato pot boiling on the fire outside to the grass while he set fire to her house. One of the most poignant tales in oral tradition tells of a man in Scionaiscaig (cleared 1810) who carried his father on his back from their burning home, to Culnacraig.